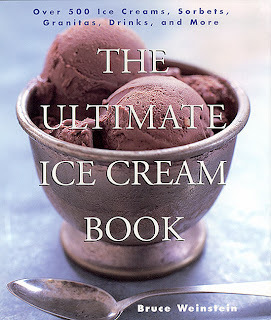 I have one book in my collection of hundreds of books (ice cream and otherwise) that needs to be rebound: The Ultimate Ice Cream Book: Over 500 Ice Creams, Sorbets, Granitas, Drinks, And More by Bruce Weinstein. This book is my bible, my go to book...Seriously. I mean, the binding is cracked and the pages are falling out. I'm not saying they did a poor binding job -- I just think it has been overused! I need to take it to Kinko's to have them put a spiral binding in it! If you go to Amazon and do a search on ice cream it is currently number three on the list. I'd say it should be number one, but I have to put it at number two since you can't use it without an ice cream maker! Anyway, I was just thinking as I used it the other day about what a great investment it was and if there was ever a book more loved...So I thought I would give it a little shout out!